A friend of mine is going to Paris for a few days in June and asked me if I could give her some recommendations. Giving some recommendations to go to Paris is an absolute delight. When I was in my teens, I was lucky to visit Paris often. My cousin, who was studying at L’Ecole de Beaux-Arts, took me around beautiful places and was my personal tour guide in the galleries. Today, I continue to visit Paris regularly. There is always a museum, a restaurant, a pâtisserie to discover. When I am at home, Paris is never far away thanks to books, music and films. Last October, I visited the Musée de l'Orangerie which was closed in 2000 for renovation until 2006. It was completely restructured and the result is fantastic. It is the home of Monet's famous water lilies but also the home of the Paul Guillaume collection. Before your go to the City of Lights, make sure you whet your appetite and set your mood! Read La cantatrice chauve and La leçon - translated as The Bald Soprano or The Bald Prima Donna - written by Ionesco. It has been showing everyday in a little theatre in Paris and that is how you are going to finish your day. So, it is best to know the story before getting there especially if you are still learning French. La cantatrice chauve is an absurd play. There is no plot, the characters are zany and the conversations are disjointed. You will die of laughter. Watch Amélie, Paris Je t’aime, La môme, An American in Paris, un monstre à Paris or Midnight in Paris. Listen to : ‘Le Poinçonneur des Lilas’ by Serge Gainsbourg; ’Sous le ciel de Paris’ by Edith Piaf ou Zaz; Ménilmontant by Charles Trenet. Finally, why not taking a few online French lessons to impress and boost your confidence when talking to French people ? You are now in Paris. 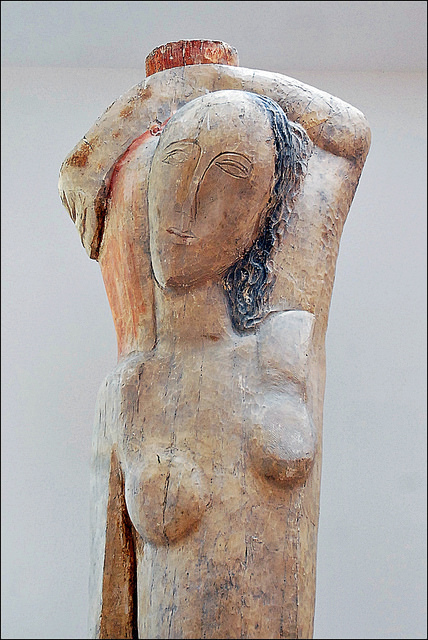 1) Your first stop is at Musée Zadkine. Ossip Zadkine, a Russian sculptor and his wife, the painter Valentine Prax, lived and worked in this haven of peace between 1928 and 1967. 2) Walk through the beautiful Jardin du Luxembourg. The gardens were inspired by the Boboli Gardens in Florence and were created in 1612. 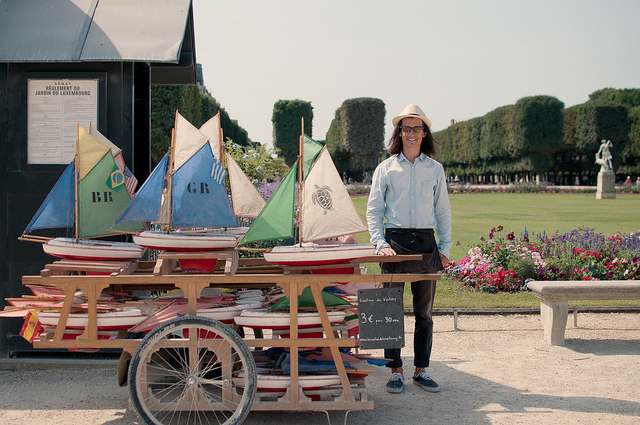 For a small fee, children (big or small) can rent a toy sailboat from this man and sail it in the grand basin. 3) At lunchtime, go to La cuisine de Philippe and enjoy a beautiful meal. Why not try his wonderful soufflés…. one for a starter (emmental or mushroom) or/and one for a dessert (rhubarb, caramel or pistachio) ? 4) Visit the amazing Église Saint-Sulpice which is the second largest church in the city after Notre-Dame. There, you will be able to admire one of the most beautiful pipe organs and the magnificent Delacroix paintings that have been refurbished in November 2016. The famous pipe organ was constructed by Aristide Cavaillé-Coll in 1862. 5) Indulge yourself with something sweet at la pâtisserie Michalak. Their millefeuille vanille tonka caramel looks delicious! Which treat will you choose ? 6) You are now close to Saint Germain des prés. Let’s go shopping Rue de Rennes, rue de Sèvres and Boulevard Saint Germain. 7) Earlier on, you discovered the beautiful paintings by Delacroix. You are now going to visit the museum dedicated to him and his art : the Musée Eugène Delacroix. This was his last home. He moved there in 1857 to be closer to Saint Supplice and accomplish his work. The beautiful house of Delacroix and its garden. 8) Before your play starts at the theatre, what about wandering on the Île de la Cité. It is 7 p.m., you are at le théâtre de la Huchette. I guarantee you that you will have a fantastic time. Both La cantatrice chauve and La leçon are wonderful plays. Finish your day at la crêperie de la petite bouclerie, 33 Rue de la Harpe. They offer lovely galettes and crêpes. If you are very hungry, go to le Petit châtelet, 39 Rue de la Bûcherie.